The NPower Nigeria Graduates recruitment for 2017 has been officially given the go ahead to accept applications from new intakes. 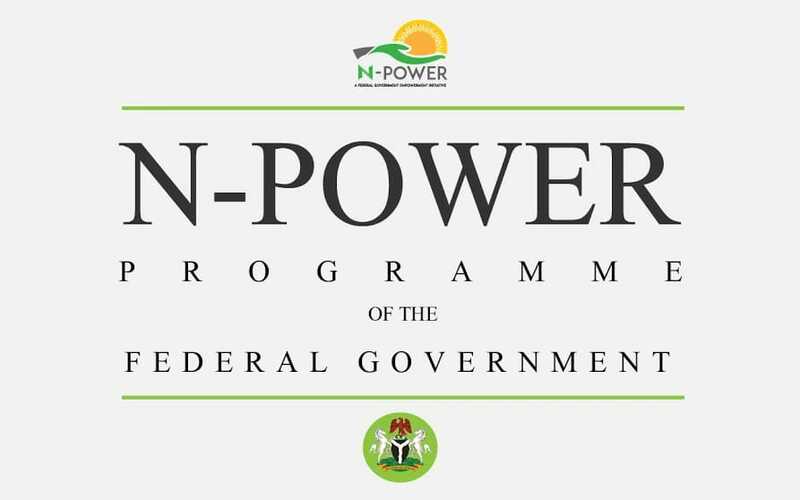 Consequently, the NPower Application portal opens on June 13, 2017 by 11:30 pm for the second batch of new registrations. Check Below for Latest Npower Updates - 30th June. The first batch 2016 NPower application process went through quite a number of changes before the system stabilized, some applicants were frustrated as they encountered incorrect or missing details and others had eligibility issues. This article presents a step-by-step guide on how to apply for the NPower second batch Graduate Recruitment 2017. The application process has been greatly simplified. Please Note that the N-Power 2017 Registrations is ONLY for Graduates. The Non-graduates for their respective categories in 2016 are still being processed, so dont bother to apply if you have anything less than NCE. 30 June Updates: The N-Power scheme has today announced on their social media platform the test date for all applicants who applied in this year 2017 recruitment. 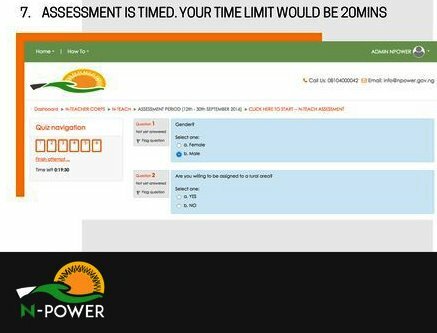 The N-Power Assessment Tests will commence on the 1st of July, 2017. Applicants who applied for N-Power TAX will write their assessment tests first. Applicants who register between July 1st - July 13th will write their assessment tests between July 25th - July 31st. Once you receive an SMS to write your test, follow the steps below. 1. You will receive an SMS to write the assessment tests because you BVN records match your application. Kindly remember that ONLY applicants whose BVN records match their application will write the assessment tests. The decision to conduct a test for all applicants was taken in a bid to avoid some of the issues of the 2016 applications. According to N-Power NG, the portal for application will be closed on 13th of July 2017. 6. A pen and paper to record your unique reference number (or you can print or snap it). 1. Visit the official NPower Application Portal and register by creating a username and password. 2. You will be sent an email containing your details which you then use to sign in. If you run into any problem at any stage or you need updates, drop a "hi" on the WhatsApp Group. 3. Click through the various programmes and choose the relevant one that match your qualifications and then click on apply at the bottom of the page. There are 4 categories; Health, Agro, Teach and Tax. Health is for Health-related disciplines, Agro for Agriculture courses, Tax for mainly Social Science and Teach can be considered for all other disciplines including Engineering and NCE. Good knowledge of ICT is needed here. 4. The next page will bring out an Application form page which you will fill carefully with accurate information and documents to support your application. Note that any false basic information especially as pertain your Date of Birth which differs from the information on your BVN database leads to automatic disqualification. 5. After successful submission, you will receive an acknowledgement email letter confirming the receipt of the application but you will have to wait a little to confirm your eligibility. 6. 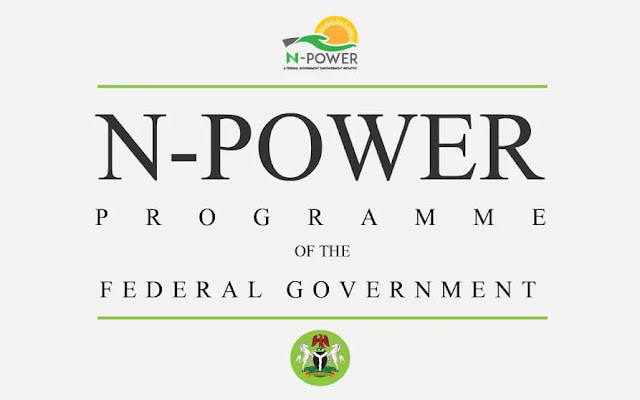 You will be notified by email and also on your profile on the registration portal whether you are eligible for the N-Power program, if you are unsuccessful you may apply again in subsequent programs. 7. If you are successful you can proceed to the test page at the MY N-POWER PORTAL, you will be required to write two tests; a general skills test and program specific test. 8. Depending on your program there may be a final interview before acceptance into the N-Power program, otherwise you will receive an email confirming your provisional acceptance into the N-Power program. 9. You will have to confirm your acceptance to secure your place. Specific information and program details will now be sent to your email. The NPower registration 2017 would run for a month. The closing date for submission of applications is 13th July 2017. If you want us to help you with more information at the right time about NPower Nigeria Recruitment 2017, kindly provide us your email Address in the “Subscription Box” below. Also feel free to ask any question pertaining to this guide. Please N-Power Agro is not in the write up. Please, after my registration, I sent the application but before I could copy or print my application number, the Nepa interrupted and I after a while, I login to restore my page but couldn't find my application number slip displayed earlier before the nepa interruption. What do I do now to get my application Number. Can I submit two times? I need your response please. You are not advised to submit twice even if you can. Multiple BVN entries leads to automatic disqualification. What you should do is, send a mail to apply2017@npower.gov.ng requesting for your application number. Make sure you include these on your mail: 1. Your email, Full Name, BVN number and the date you submitted. That new site for NPower application https://apply.npower.gov.ng/index.php get as e be. They accept multiple entry unlike the main portal that checks your BVN before next stage. Also their reference number is quite different. To be very sure, try as much as you can to apply on http://portal.npvn.ng/apply/apply.html FIRST! is it true that there will be exam after 48hrs and will be sent an email to you. A lot have changed in the process. NPower says all applicants should visit their social media pages (Facebook and Twitter) for updates on further instructions. please i need help, i applied for the npower program using the new portal where i have to just visit the website ,choose my program and apply. but lately i have being hearing from my friends that i have to upload a passport,c.v and nysc certificate.i don't know if i applied wrongly, kindly help me out.i was told in need to get a confirmation email to show that i succeeded in the application but up till now i haven't gotten any. help a worried person.thanks. Everyone who registered after June 15th have been redirected to a new site which you dont need to upload anything. Just keep your ref number safe, you will be contacted. Once the first person has been contacted, we will update you here. For all questions about how to get back your reference number if you did not copy it down, NPower official response is that "we will provide communication about the next step". This means that all applicants will be contacted. Check the facebook comments on this page to see the screenshot from NPower facebook page. Yes, you can withdraw your NPower application at any time. Just write to APPLY2017@NPOWER.GOV.NG and request for withdrawal. Sir, can someone get N-teach-2017 - 00000-74 as unique reference number. Because other are getting N-teach-2017 - 00000836632-73 format. Please 00000 is ok. Please, i need your comment. Have register for Npower programme and get my reference number please i want to ask for the next action after the reference number. and also can someone who did not have NYSC certificate can apply for npower programme (HND part-time). The next action after you have gotten your reference number is to wait for SMS notification for test.